The path this book travels towards findable websites passes through the villages of web standards, accessibility, and contemporary technologies like Ajax, APIs, Flash, and microformats. You’ll find the big ideas behind each of these contemporary technologies and real world examples presented in this book, illustrating that you don’t have to compromise the rich user experience in order to create search engine friendly, findable websites. Although tailored for people who build websites, there’s something here for people in the user sciences, designers, and project managers running the show. Findability is everybody’s concern because everyone wants his or her work to be seen and appreciated. If you’re a web standards guru often struggling to help colleagues and clients see the light, you’ll find the concepts and examples in this book of interest. Search engine optimization and general findability are the most compelling arguments for web standards best practices, as they speak to the bottom line. Companies waste fortunes seeking a magic bullet for Search Engine Optimization. But the keys to honest, effective web findability are appropriate writing and semantic markup. Aarron Walter’s wonderfully lucid and informative book tells everything you need to know to get your web content (or your client’s) in front of as many appreciative readers as possible. Information that’s hard to find will remain information that’s hardly found. 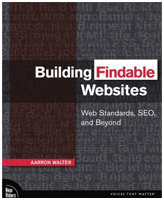 In Building Findable Web Sites, Aarron Walter provides an invaluable guide to avoiding obscurity on today’s cluttered Web. Since 1999 Aarron Walter has been building websites professionally and teaching courses in interactive art and design at colleges and universities including Temple University, The University of Georgia, and The Art Institute of Atlanta-one of the few colleges teaching Web standards since 2002.